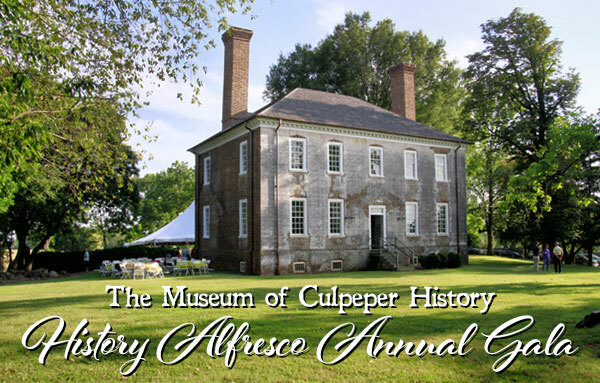 Help support one of our partners and local museums, The Museum of Culpeper History! On Saturday, October 7, they are hosting their annual fundraiser and 40th anniversary at Germanna Foundation’s historic Salubria Manor from 5:30 pm to 9:45 pm. The evening will commence at 5:30 pm with amazing wine and hor d’ouevres on the lawn and tours of Salubria. A three-course seated dinner will then begin at 7:00 pm with food provided by Shawn’s Gourmet Catering. Presentations about Salubria and the Museum of Culpeper History will occur during this time to celebrate our recent successes and future plans. A Silent Auction will be conducted until 8:30 pm this evening featuring many wonderful items for you to take home–such as vacations, fine art, home decor, and gift certificates. All of our activities this evening are conducted to support your local community museum: The Museum of Culpeper History. The event is Black Tie optional and you must RSVP by September 28. Individual Seats are $120 per person. Table sponsorship opportunities are also available beginning at $1,000 for a table with 8 guests. Please call Morgan Pierce, Executive Director of the Museum at 540-829-1749 to learn more about our event and reserve your seats today.